Annie Santos is a business law attorney and focuses her legal practice on business litigation and labor and employment. She represents and guides businesses, their owners, and human resource professionals in business disputes and transactions, employment-related matters, the development of organizational documents, and provides counsel in contract and real estate matters. She provides clients with advice on everyday matters, and if necessary, protects their interests in litigation. Additionally, Ms. Santos devotes a part of her practice to life, health and disability litigation, both ERISA and non-ERISA. Ms. Santos has been involved in complex litigation matters, including serving as class counsel in a class action matter advocating for the civil liberties of individuals with developmental disabilities. 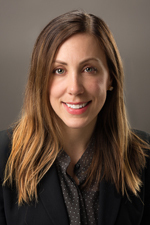 Prior to joining Hinshaw & Culbertson LLP in March 2014, Ms. Santos was a litigation associate at another Minneapolis firm where she gained significant experience in federal court litigation in a variety of areas. Prior to her legal career, Ms. Santos was a compliance specialist for an international brokerage firm in San Diego, California. Minnesota Chapter FBA Annual Seminar Planning Committee, Member (2013–2014). "FERPA Compliance for Schools," National Business Institute Webinar Series, February 2014. "Special Education Laws Made Simple," National Business Institute Continuing Education Series, June 2013. "Investigation of Employment Discrimination and Harassment Claims," Minnesota School Boards Association Annual Leadership Conference, January 2013. "School Safety and Anti-Bullying Update," Minnesota School Boards Association Annual Leadership Conference, January 2013. "MSBA Style Show: Can They Really Wear That to School?" Minnesota School Boards Association Annual Leadership Conference, January 2012. "Intellectual Property Rights of Public Schools," Minnesota School Boards Association Annual Leadership Conference, January 2009 and January 2010. In additional to her legal work, Annie also advocates for the protection of animals from cruelty, particularly farm animals, and promotes compassionate living for all.